Surprise! Babies we love! – Do your dream! Okay, get up off the floor, these babies are sweet and cuddly! We are fortunate to have a regular fox guest amost on a daily basis, and it looks like her family has grown. 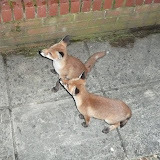 Over the last couple of days we’ve seen 4 fox cubs in the garden playing. Last night they didn’t seem to mind our company either. How sweet are they!!! ← Snowboarding over – both passed!